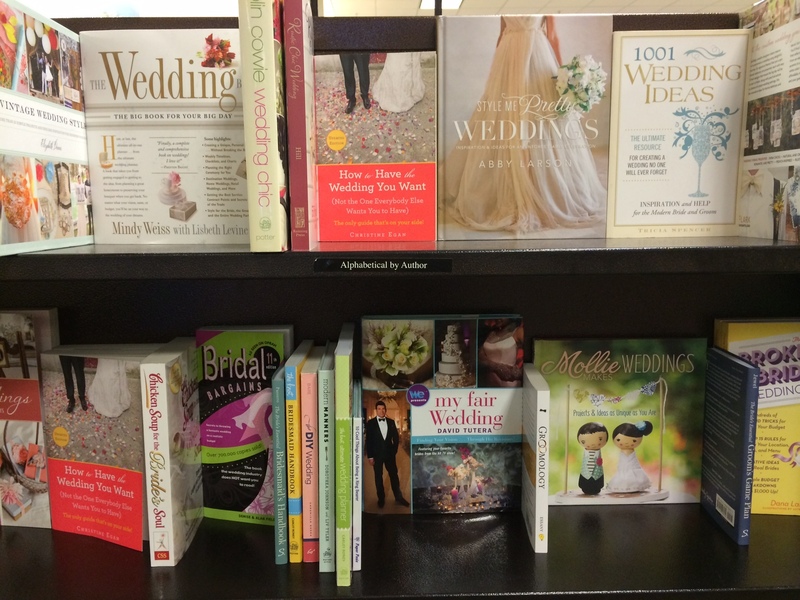 Within two days of arriving home after our Virginia Beach engagement, I found myself standing in Barnes and Noble, staring at shelf upon shelf of books for brides-to-be. 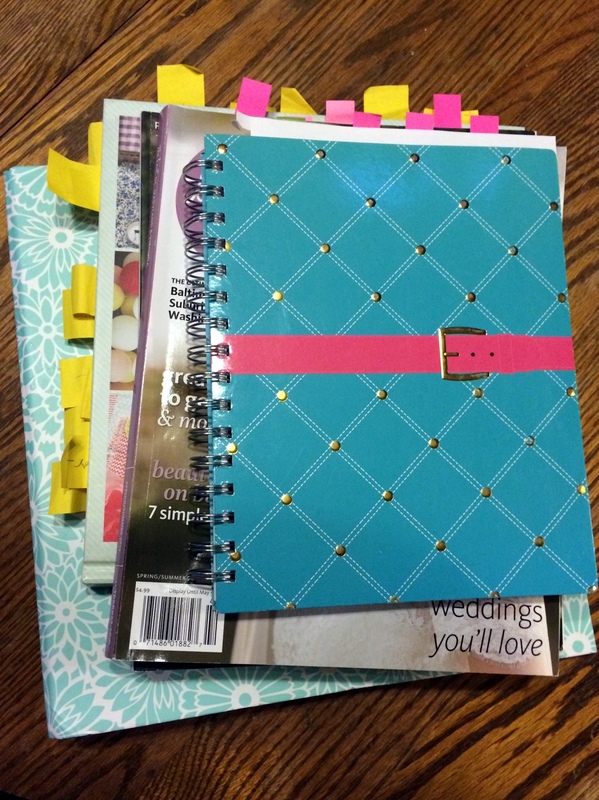 There were planners and checklists, do-it-yourself decorating tips, weddings-on-a-budget books; thick binders and skinny hardbacks and sleek spiral-bound volumes of all shapes and sizes (weirdly, a bit uniformly pink in hue–really, are we twelve?). All claimed they’d help me plan the wedding of my dreams. And I hadn’t even gotten to the magazine section, where a row of strangely serious, sculpted women, all angled elbows and white lace, brooded out at me from the covers of at least ten different glossy tomes. I was mesmerized. And a little horrified. Sidebar: I do not believe marriage is the pinnacle experience of a fulfilling life, for a woman or a man. In fact, I spent some serious years in cheerful, occasionally even blissful, acceptance of my long-term singledom and its opportunities. Nor do I equate the human longing for love and connection with the desire to get married; one can experience either of those yearnings entirely separate from the other. Nonetheless, the world sends many messages, especially to young women, that if you don’t find world-changing, mind-bending, once-in-a-lifetime soul-mate love, you’re doing something wrong—and “find” is the word of choice, though it seems a rather passive means for achieving something the world insists is so crucial. Combine that pressure with the whole fairy-tale-princess aspirational myth we still groom in our girls, and the fact that few other rites of passage are anticipated and celebrated with the same fervor as weddings, and you have a powerful brew, one I’d been sipping on since I was a child playing with dolls. Maybe that’s why the covers of wedding books rely heavily on the same suite of the color spectrum as does Barbie: the pinks and peaches and purples are intended to take you right back to those early fantasies, and their concomitant fears. And maybe that’s why, though I’d flipped through the occasional bridal magazine in the past, wishing or dreaming, I’d always steered clear of the wedding-book aisle. I now understand that love, marriage, and intimacy are complex organisms; struggling to, yes, find or sustain any of the three is the normal human condition. But for many years I wrestled with the feeling that absent a partner, I was failing in some way. In college, engagements multiplied around me faster than flu bugs swept dorms, even as the sum total of my undergraduate boyfriends reached a high of one (and that for maybe six months). By the time I finished grad school, still single, I’d hear other women talk about “when I get married” with an air of confidence I could no longer muster. Soon I began to watch the students I taught, six and eight and ten years younger, show off their rings. It seemed like everyone but me was tying the knot. Did my perception match reality? According to a Pew Research analysis of census data, only a little over a third of those in my generation got hitched between the ages of 18 and 32. A full 48% of baby boomers got married within that range, but for my Generation X demographic, the number dropped to 35% (and has since, by the way, dropped to 26% for Millennials). That statistic suggests maybe I shouldn’t have felt so out of it after all. Yet according to an Urban Institute study, 77% of men and 82% of women born in 1970 had been married at least once by age 40. Technically I missed a 1970 birthday by one month and three days, but that’s my peer group—which means I was one of the 18% of women who was still filing individual tax returns several years past the big 4-0. 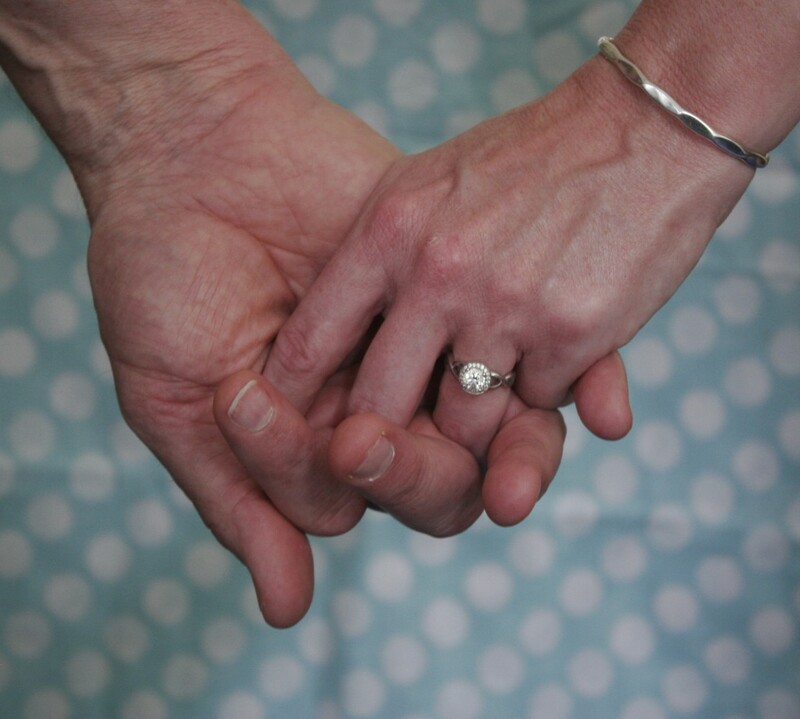 All this to say: however fully I’d embraced my singledom in recent years, it was a tiny bit delicious to stand in the wedding-book aisle with a sense of belonging instead of just longing. But good grief, what the heck was all this stuff? I was getting my first taste of what’s been called the modern “wedding-industrial complex.” And it was enough to give anyone a complex, alright. Nadine Friedman, in an essay about wedding reality TV, describes the wedding-industrial complex as “a rabbit hole of cultural, social, and economic pressure,” and notes that the proliferation of high-drama bridezilla features is one symptom. I’ve never had cable or satellite TV, so while I’m vaguely aware there are numerous reality bridal shows, the only one I’ve ever seen is Say Yes to the Dress. It seemed to me they were missing a third rhyme: stress. The show had some sweet moments, but I kept thinking, that young woman has found love. Why is everyone so snappish and unhappy? And why on earth would you ever think it a good idea to bring seven opinions along on any shopping trip? But within minutes of flipping through wedding books, I could see evidence of the rabbit hole everywhere: since when had it become the norm to hire a calligrapher to hand-letter every invitation, buy not one but two wear-just-once dresses, throw a big breakfast the morning after the wedding, or rent a fancy car to haul not just you but your entire wedding party to a second “after-party” reception? It all sounded exhausting, not to mention crazy expensive. Even when stressed out, I don’t have the temperament to morph into a Bridezilla, but all this stuff was making me question whether I even wanted to claim the capital B-Bride identity I’d been enjoying just moments before. The convolutedness of it all was almost enough to make me want to elope. So, I was relieved when I spotted a planner that seemed in sync with my mixed feelings: The Anti-Bride Wedding Planner. It was garishly pink, with turquoise and lavender accents, but it was also smaller and simpler than the other guides, and it eliminated or ignored a lot of the pricey fluff-n-stuff other books treated as de rigueur. Finally, I settled on two magazines (an indulgence—when else will I ever buy them? 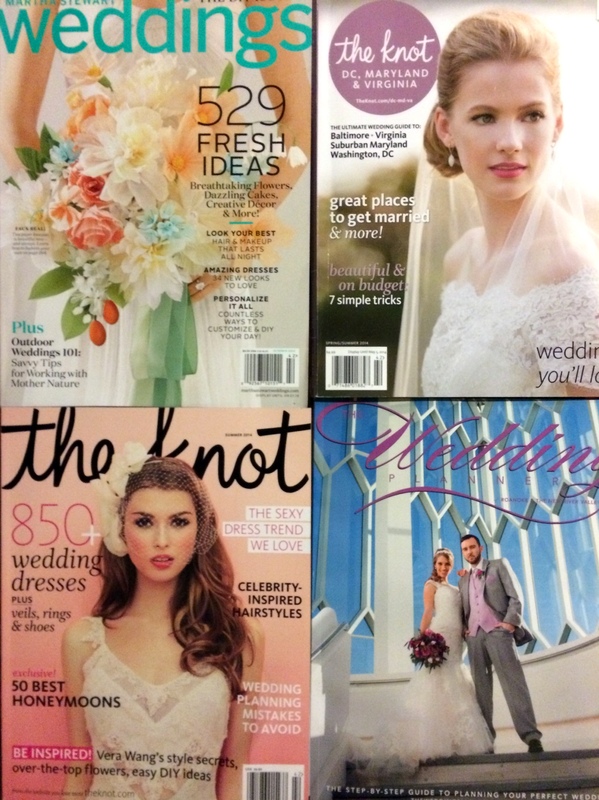 ), a book on vintage wedding style with a DIY focus, and the minimalist planner. No Bridezilla or even capital B-Bride for me. I was a budget-wise, DIY, Anti-Bride! Then I immediately went home, sat on the couch, and feverishly tagged so many pages with post-its marking all the things I liked and wanted to do that I hid the books from Steve the next time he came over, because I was afraid I’d freak him out. Huh. Maybe this “Anti-Bride” thing was going to be harder than I thought. With every post I read here I see why Steve’s so fond of you. Keep fending off the wedding-industrial complex, enjoy the fresh air and clear view outside the rabbit hole, and have fun!